A sweet juicy fruit that has skin that ranges from white to rich yellow to reddish brown and flesh that ranges from yellow to deep gold and red. The skins have a soft, fuzzy surface and the fruit contains a large pit in the middle. Most often peaches are sold not by variety but by the color of their flesh: white, yellow or red. 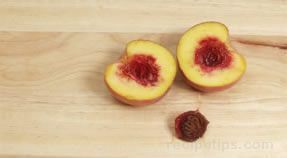 A white peach has a very similar flavor to the yellow peach, just a different color of flesh, while the red-fleshed peach is tarter in flavor. There are many different varieties of peaches grown today, all of which are generally classified as clingstone, freestone, or semi-freestone. Clingstones have stones or pits that cling to the flesh of the peach while freestones are easily separated from the flesh. Semi-freestones, which are smaller sized than freestones, are hybrids of the clingstone and freestones, but have a stone that detaches quite easily from the flesh. Peaches are a popular fruit used for many purposes, such as in desserts, pies, puddings, cobblers, shortcakes, salads, as breakfast toppings, for canning and to just enjoy eaten fresh out of the hand. Dried peaches are also available in slices, diced pieces and ground. They have a sweet tart flavor and are treated with sulfur dioxide to retain coloring. Available May through October. The peak season is July and August. Because peaches spoil easily, it is best to purchase only the quantity that will be consumed in a short time. Select fruit that are fragrant and that give slightly to pressure. Avoid peaches with blemishes, bruises or green coloring. Store ripe fruit in a refrigerator for up to 3 to 5 days. Remove from refrigerator 30 minutes before eating to bring out full flavor of the peach. Store unripe peaches at room temperature. 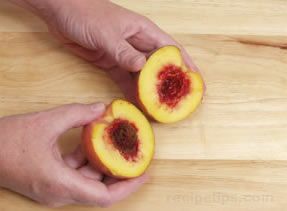 A variety of peach that has deep yellow colored flesh with skin that is deep yellow with a blushing of pink to deep red. The flesh is more acidic than the white-fleshed peach. Its tart flavor sweetens as it ripens and the flesh begins to soften. Even though it is a little tarter than the white-fleshed peach, it is popular for baking because it has a more intense peach flavor. A variety of peach with a pale white-colored flesh that is covered with a skin that is creamy or pale yellow in color blushed with pink. It is less acidic than the yellow-fleshed peach but is sweeter with a less intense peach flavor. The white-fleshed peaches have a sweet flavor even when the flesh is still firm, whereas the yellow-flesh becomes sweeter as its flesh softens. White-fleshed peaches have a tendency to bruise more easily so they should be handled with care. A variety of white peach that originated in Asia. The name was derived from the appearance, which looks like a cake donut. The peach is approximately 1 to 2 inches in height and 2 to 3 inches in diameter. The outer skin has a pale yellow and red color that covers a white inner flesh that is tender, juicy, and sweet tasting, similar to a nectarine. The peach has a low acid to sugar ratio, so it is sweeter than the orange flesh variety. 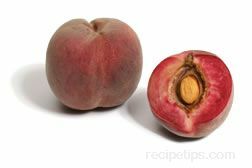 When selecting donut peaches, seek those that are not too green, but are beginning to show the yellow red coloring. A peach that is large in size that has a dark red colored skin that surrounds a similar red juicy flesh, which provides a tart flavor. 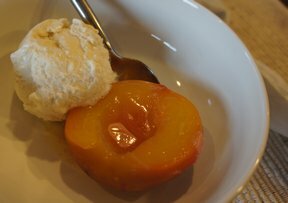 While the blood peach is tarter, the white and yellow-fleshed peaches have similar sweet tasting meat. The blood peach is served fresh or is often used for making chutneys, jams and preserves. A variety of fruit that has a dull, dark red outer skin with crimson to red inner flesh. This peach is generally used to make preserves or to color peach ice cream. It is a delicate fruit as it bruises easily. It is referred to as pêches de vigne in France. Peach skin can be removed by simply peeling with a utility knife, but this method tends to waste much of the flesh of the peach. 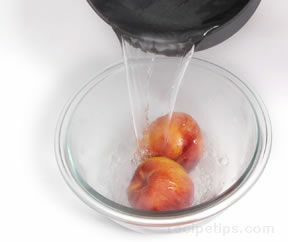 The following method of removing peach skin preserves the flesh of the peach. Cut a small slit in the upper portion of the peach skin. Place peaches in a heat safe bowl. Pour boiling water over peaches to cover. Leave peaches in boiling water for 30 seconds. Remove with a slotted spoon and submerge into cold water to stop cooking process. 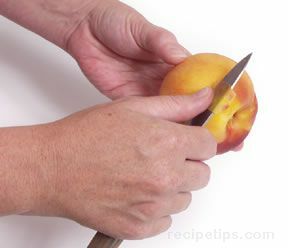 Remove peaches from cold water and, using a small pairing knife, pull skin off. Begin with pairing knife at the top of the peach and pull downward. 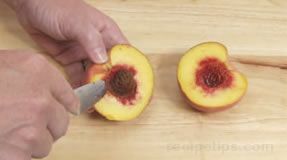 To remove the pit of a peach, cut around the perimeter (follow the natural indentation) down to the pit using a small knife. Begin the cut at the stem of the peach. 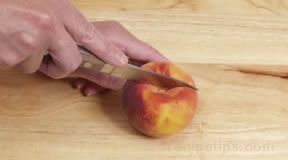 Make a sliced around the entire perimeter of the peach. Twist the peach halves in opposite direction until they separated from each other. 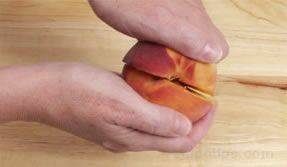 The pit will remain in one half of the peach when they are separated. 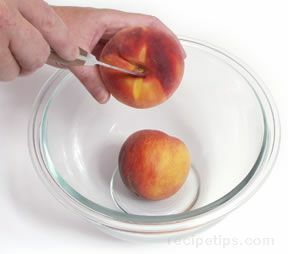 Remove the pit using a knife or your fingers to pry it loose from the center of the peach. Prevent browning of fresh cut peaches by dipping fruit into a mixture of 1 cup water and 1 tablespoon lemon juice. One pound of peaches equals approximately 4 medium whole peaches, 2 cups peeled and sliced, or 1 1/2 cups puréed. Speed ripening of peaches by placing in a paper bag with an apple and store at room temperature.